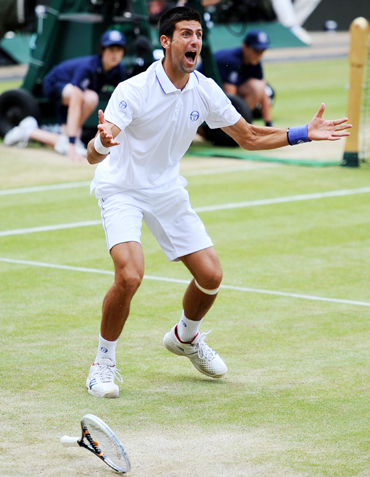 Novak Djokovic is enjoying such a magical year that even patchy form and the acrobatic brilliance of Jo-Wilfried Tsonga could not stop him reaching his first Wimbledon final and becoming world number one on Friday. The Serbian's 7-6, 6-2, 6-7, 6-3 semi-final triumph over the Frenchman included a bout of early nerves, three great diving exchanges at the net, a topsy-turvy tiebreak and an explosion of jubilant emotion he will struggle to repeat if he wins Sunday's final. The second seed will meet either incumbent number one and defending champion Rafa Nadal or Andy Murray in the showpiece final but will take the top ranking when the new ATP list is issued on Monday whatever happens. The 24-year-old, who won 41 matches in a row from the start of the year before losing to Roger Federer in the French Open semi-finals, will become the first Serb to be men's world number one. "It's definitely one of the most important achievements and days in my life, in my career. When you know you're going to be the best in the world and you're reaching the final of your favourite tournament, it's something special," he told reporters. "(Rafa and Roger) are incredibly consistent with their success and so dominant the last couple years. They don't give you a lot of chances to become number one. So I guess you need to lose only one match in seven months to get there. If you can do that, then well done." Several athletic encounters at the net, with Tsonga diving around and playing shots practically on his knees, spiced up the semi-final and entertained the crowd with scenes rarely witnessed at the grass grand slam since Boris Becker's pomp. Tsonga's powerful hitting from his shock last-eight win over six-times champion Roger Federer melted away, though, under the sun in the second set as Australian Open champion Djokovic produced a few touches of flair to romp through it. The third set appeared to be heading the same way before the 12th seed, cheered on by the Centre Court crowd, suddenly found a second wind to break for 4-4 but Djokovic hit back for 6-5 only to lose his serve immediately. The enthralling tiebreak swung both ways and Djokovic wasted two matchpoints before Tsonga, the 2008 Australian Open runner-up, overcame problems at the net to take it 11-9 and spark a serious case of fist-pumping. Djokovic has not been at his very best all tournament but powered ahead in the fourth set with a break to love for 2-0 when Tsonga's radar again faltered. 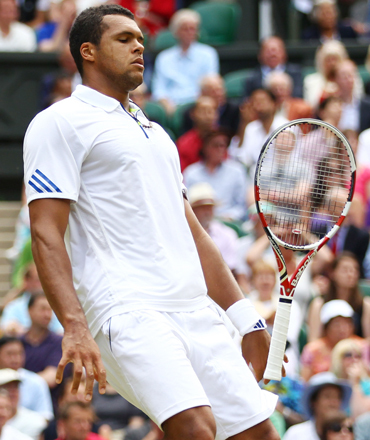 Crowd favourite Tsonga was a gracious loser. "Today I played well. My opponent was just better than me today," he said. "I tried to take my chance on every point, but it was just tough because he was running everywhere and the ball was coming back all the time. I feel tired after this match." Rafa Nadal crushed Andy Murray's Wimbledon dream in the semi-finals for the second successive year with an emphatic 5-7, 6-2, 6-2, 6-4 victory on Friday. The top seed and defending champion, who will face Novak Djokovic in Sunday's final, was outplayed by the fourth seed in the first set but he raised his game in the second and won seven games in a row to take control of the match. Nadal, who will lose his world number one ranking to Djokovic next week, stayed on course for a third Wimbledon title and 11th grand slam crown. The victory continued the remarkable Wimbledon run of the Spaniard, whose last defeat in the tournament came in the 2007 final against Roger Federer. Nadal won it in 2008, missed 2009 through injury but came back to triumph again last year after also beating Murray in the semis. "It's a dream to be back in the final," Nadal said in a televised interview. "I feel sad for Andy. I think he deserved to be in the final. I wish him all the best for the rest of the year and the U.S. Open. "I played very well to win against Andy. I need to play my best tennis. He's a great champion. To beat him the only way is to play really great shots. I did that today." Murray, bidding to become the first British men's singles champion at Wimbledon for 75 years, had no answer to the Spaniard's sustained brilliance, making a string of unforced errors as the match slipped away from him. Murray looked completely focused and there were none of the desperate pleading looks towards his family or the berating of himself after an error that all-too often upset his equilibrium. It was tight again in the early stages of the second set but the match seemed to turn in the fourth game. Nadal was struggling at 15-30 and 2-1 down when the pumped-up Briton sent an easy forehand long. Instead of pressuring for the break, Murray went on to lose the game, sparking a run of seven successive games for the Spaniard that won him the second set and gave him the early initiative in the third. "He had an important mistake, easy forehand, that was probably one of the turning points of the match," Nadal said. Despite sending five rackets out to be restrung, Nadal maintained his relentless forehand assault while Murray's radar was faulty and another break and superb serving enabled Nadal to sweep through for a 2-1 lead. Murray needed to rediscover his early fire but he was ragged again in the first game of the fourth set when an inconclusive volley allowed Nadal to send a backhand pass screaming under his nose on the way to another early break. Murray never looked capable of stopping the flow as Nadal, who also beat him in the French Open semi-finals this year, cranked up the pressure with his relentless accuracy and variety of shot.